You are here: Home / Climate / Australian Alps to be "free of snow by 2050"
Australian Alps to be "free of snow by 2050"
AUSTRALIA’S ski slopes could be completely bare of natural winter snow by 2050 unless concerted action is taken against global warming, according to a government-commissioned report that paints a grim picture of the effects of climate change on alpine areas. The report, Caring for our Australian Alps Catchments, has found the Alps, which stretch from Victoria through New South Wales to the Australian Capital Territory, face an average temperature rise of between 0.6 and 2.9 degrees by 2050, depending on how much action the international community takes to combat climate change. ”The effects of climate change are predicted to be the single greatest threat to the natural condition values of the Australian Alps catchments,” the report states. Rain, snow and other precipitation will decrease up to 24 per cent over the next four decades, accompanied by more bushfires, droughts, severe storms and rapid runoff, causing heavy erosion. Australia’s major mountain range, which peaks with Mount Kosciuszko at 2228 metres, is vulnerable to climate change and faces a dramatic transformation unless serious efforts are made, the study concluded. ”The scenario that is most likely is that there will be less snow both in total and in area, and that we shift more to summer rainfall,” said study co-author Roger Good, a retired botanist with the NSW government. A “botanist”? Gasp! But he’s not a climatologist! Shock! How many peer-reviewed papers on climate change has he published? [Cue sound of gramophone needle being hastily removed from surface of record] No, wait a minute, he’s saying all the right (alarmist) things that back up our policies, so it doesn’t matter. As usual, all of this is based on flaky computer modelling, which is as good as useless for any kind of climate projection. But who cares? The timing is perfect – government fear-mongering to scare the population into accepting, if not supporting, the pointless carbon tax. But hang on a minute… what will having a carbon tax do for the Alps (even if we assume the nonsensical alarmist viewpoint of manmade CO2 being the only control on the planet’s climate)? Reduce the temperature by about 0.0001˚C, that’s what. And will it make any difference? Nope. Reminds me of that article in the UK Independent that said that snow in Britain was a thing of the past… yeah, right. Just because they can’t predict accurate weather for the same afternoon doesn’t mean that they’re not 134.2% correct on this forecast 40 years from now. OMG! Someone obviously didnt get the memo: It’s cooling! Inform them, before it’s too late! Note how they don’t even mention what it might be like in 5 years, or even 10. When the forecast year finally arrives, they would have been long forgotten, and the government of the time will find it difficult to bring them to account. Any sane government would take the report with a grain of salt. Are these the same people who predicted the Himalayas were going to be snow and ice free in 2035? The irony being snow predicted to fall to 1300 metres last night. They will seriously dredge up any bulls#@t to sell this tax. There is snow business like snow business…..
Should the botanist’s prediction be correct, the projected increased summer rainfall would act as a bushfire deterrent…. ….Got to fly and ring a librarian to fix my plumbing …. 1. Dr. Dionysus Larder (1793-1859), “Rail travel at high speed is not possible because passengers, unable to breathe, would die of asphyxia”. 2. Oxford professor Erasmus Wilson, “When the Paris Exhibition [of 1878] closes, electric light will close with it and no more will be heard of it”. Baldrick, the Greens are indeed genuinely progressive, in much the same way as one is progressive after falling off a cliff. Please The Age, stop being lazy and just printing media releases from global warming alarmist organisations like the Department of Climate Change (let me guess, wouldn’t be part of the government spin campaign in the week the carbon tax legislation is promulgated?). Your credibility as a news organisation suffers everytime you publish psuedo-scientific guff like this. Oh changed from 2010 to 2050 now is it? Right. Flannery categorically stated in 2000 that there would be no more snowfalls after 2010. 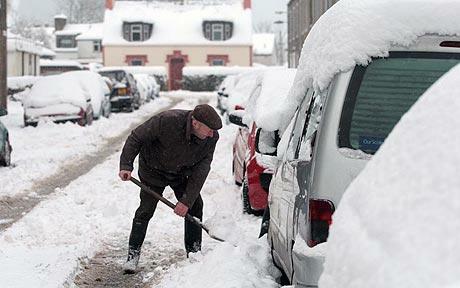 Funny, UK, Continent, USA & Canada had heaviest snow falls for decades in early 2011. As for Australia being forever in drought. What happened – floods in several States. Doesn’t know his head from his toes. Seas rising dramatically – they have risen and receded throughout history. Barrier Reef doomed because of global warming. Barrier Reef growing – only dislikes being cold!! Can the computer model also calculate whether Liberals or Labour will be in power in 2048? I wonder how many people have read these bills ? They want an absolutely ridiculous 80% reduction in fossil fuel usage ! Solar and wind are a joke, no one wants nuclear, so everyone will have to cut energy use by 80% … back to the Stone Age folks ! well of course it is snowing, Irritable Global Warming Syndrome, causes coldwarm, flooddrought, and the evil stormycalm. It can only be stopped by paying extra taxes to the government, change your ways before it is too late. I rate this latest prediction as bad as Tim Flannery’s many bum predictions. When are these ‘assholes’ going to stop shoveling this crap? It’s just more government propaganda. Funny… the Bureau of Meteorology cannot tell us the weather for the Melbourne Cup at this stage… but these climate change charlatans, doing the bidding of the Gillard government, can tell us Australia’s ski slopes could be completely bare of natural winter snow by 2050 unless concerted action is taken against global warming. There is that word ‘could’. They don’t know. They’re making it up. The IPCC’s model based predictions have all been proven wrong against the real world observational data on climate. So what have the authors of this latest report used? A crystal ball? They’re using ‘voodoo science’ because they certainly are not applying the scientific method. These people are involved in the greatest fraud ever perpetrated on mankind… and it’s high time something legal was done about it! The biggest disappointment, however, is the pathetic reaction by the Opposition to such nonsense… an Opposition, by the way, that is drinking from the same trough as the Gillard government when it comes to believing the pseudo-science of the IPCC on man-made global warming. Disgraceful! “Snowfalls are now just a thing of the past”!!!!!!!!!!! What a fool, Dr Viner turned out to be. His prediction couldn’t have been further from the truth! Dr Viner seemed to rely on ‘voodoo science’. What is it with these voodoo scientists? If they don’t know, they shouldn’t open their mouths making ridiculous predictions. Just to divert from the subject written by the GOVERNMENT (says it all) “botanist”! I have just read an article in the telegraph.co.uk/earth. (This paper is printed in Australia with the weeks news from The Telegraph UK) “Chinese set to be world’s worst polluters surpassing the USA. by 2017. China’s emissions actually rose 10% in 2010 to reach 6.8 tons per person. USA at the moment 16.9 tons pp – France 5.9 tons pp, – UK 8.1 tons pp. Why oh why does this government want to tax Australians for the very small amount of tons pp compared to those above? USA, China, India. Canada and a number of developed countries are not going down this path and some with an ETS are cutting back. You are asking a logical question. The trouble is we are not dealing with logical people when it comes to this mob.Whats the logic in shipping as much coal as possible to China and India to do with it what the hell they feel like? The whole thing is just ludicrous, but we can do little about it until this lying illegitimate government is obliterated at the next election. Juliars handing out shovels to all and sundry now to shovel this BS just as far as high as they can. A little thing like the wrong qualification stop will not stop a good warmist from unloading in the Fairfax press .Just look at Flannery for example. According to the very long and well established correspondence between solar activity and climate, the best estimate is that by 2050 we are going to be deep into another Little Ice Age, wondering if it is going to turn into, “the big one”: the next glacial period. Would anybody in Australia really be bothered if in the wild possibility these alarmists are right, that the Alps snow just went walkies….? Have you noticed though, their predictions are just far enough into the future for it not to be a problem for those spreading alarm… too late to sue the bastards when they’re dead. It’s time we had these alarmists prove their assumptions to Simon before they were allowed to talk to the media – (Ha).